People who do this tend to focus on sending them to new followers on Twitter (and other social networks) and they can be a great way to get across a message to those you are just starting a relationship with – especially if that message is something considerably longer or more complex than what would be possible from the limited space a Twitter bio allows. Should You Auto DM on Twitter? Of course, I (like many others) strongly argue against the use of auto-DMs unless absolutely necessary, as we all know a real, honest and true message that’s coming from a real person and is tailored specifically to be read by one specific person holds more emotional value … but sometimes that’s just not an option. And of course there are the usual reasons of marketing or “welcoming new followers” that people use auto DMs for … even though like I said, those uses of Twitter Auto DMs are generally frowned upon. 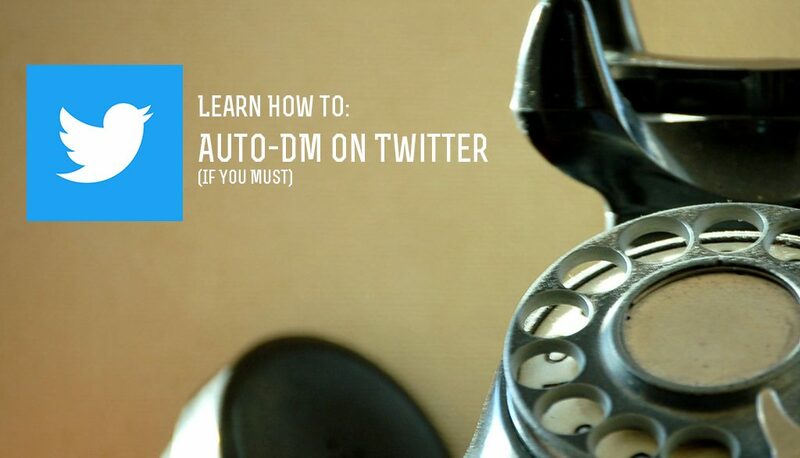 Still, if you do need to set it up, there are a few simple ways to Auto DM on Twitter. First, note that Twitter itself does not offer this functionality. It’s not against Twitter’s terms to send an Auto DM, but it’s also not something they actively encourage. 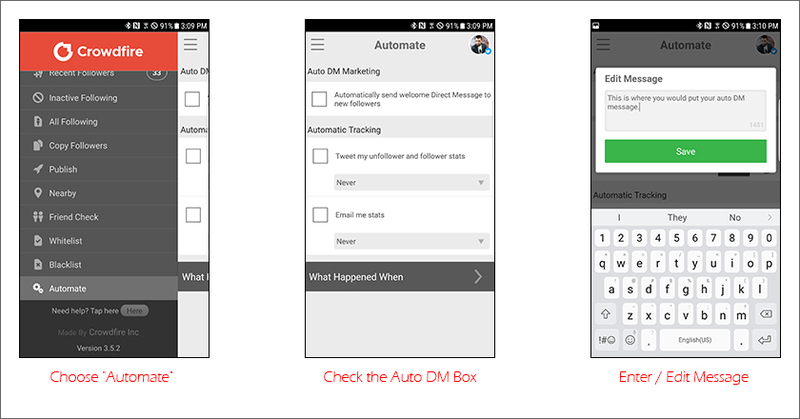 So to send an Auto DM on Twitter you’ll need to use a third-party tool. The tool I recommend most is an app and service called Crowdfire. It allows you to easily set up auto DMs for your Twitter, as well as to do many other useful things. Personally I use it for managing my folllowers and keeping my Twitter feed clean (for example, I use their “inactive users” feature almost daily so I can stop following people who aren’t active on Twitter). To do it, just get Crowdfire (basic functionality is free, but their paid model is very reasonable as well) and set up your accounts. You’re all set. Every time someone new follows you on Twitter, an auto DM will be sent out. To turn it off, just uncheck the box (your message will be saved, so you won’t have to retype it later if you do want to turn it on and off from time to time). One other popular tool for sending Auto DMs via Twitter is SocialOomph. Unfortunately, I haven’t used the tool personally though I know quite a few people who do – and while I’ve heard good things about it, I don’t like to pay for multiple services that I don’t need. Still, if you’d prefer to use it, SocialOomph does offer auto DM functionality, but to unlock it will cost you a minimum of $6.44 per month as part of their pro subscription. If you do decide to go this way, once you’ve set up your Social Oomph account and upgraded to a paid plan, all you have to do is follow these simple instructions to set up and send Twitter Auto DMs.